Who loves ice cream? We do! 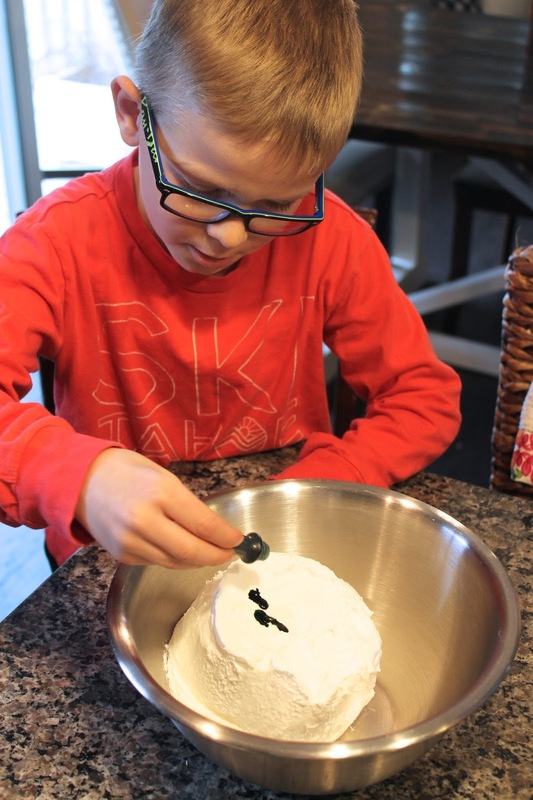 This simple and easy ice cream pie dessert is sure to please! Take it to your next party or sever it to your families. This is a crowd pleaser and so simple, you know I love simple! The great thing about this ice cream pie is you can make it a million different ways based on the ice cream flavor and toppings you choose. For this example, I made a mint ice cream pie because it’s a fan favorite over. Think shamrock shake meets pie, delicious. We placed the ice cream in the fridge to thaw for about an hour and then scooped it into the Oreo crust. Solon pretended to eat that huge hunk….hence the BIG smile ;). Smooth the softened ice cream into the pie crust. After the ice cream layer was complete, Solon mixed up the 4 drops of food coloring in with the whipped topping. You can add more food coloring for a deeper color! 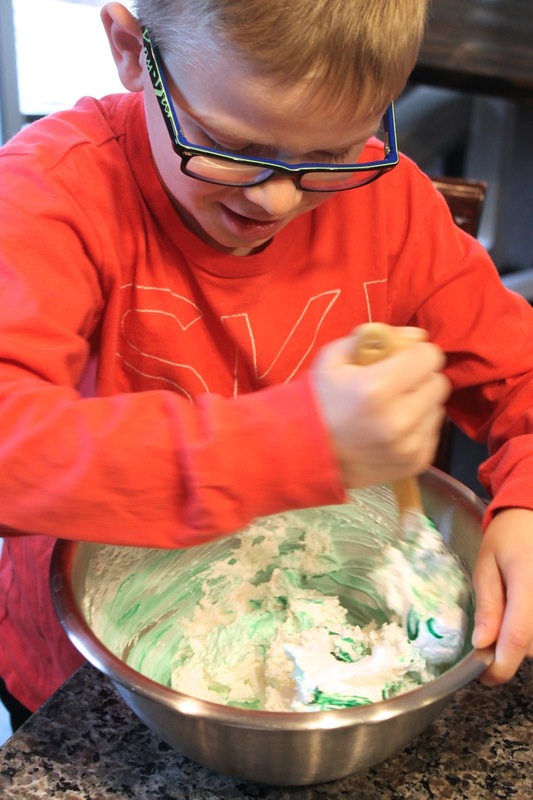 After we mixed the whipped cream and food coloring, we scooped the whipped cream onto the ice cream, and smoothed to cover. The last step was to add the garnish. They chose Andes’ mints and they crumbled the mints on to the pie. We placed it back in the freezer to harden, then wrapped it in tin foil so it would be ready to take with us to our friends for dinner. You can add any flavor of ice cream and double up on ice cream flavors. Just let the first layer of ice cream set and come back with an additional layer. You can also add in syrups, like caramel sauce or hot fudge. 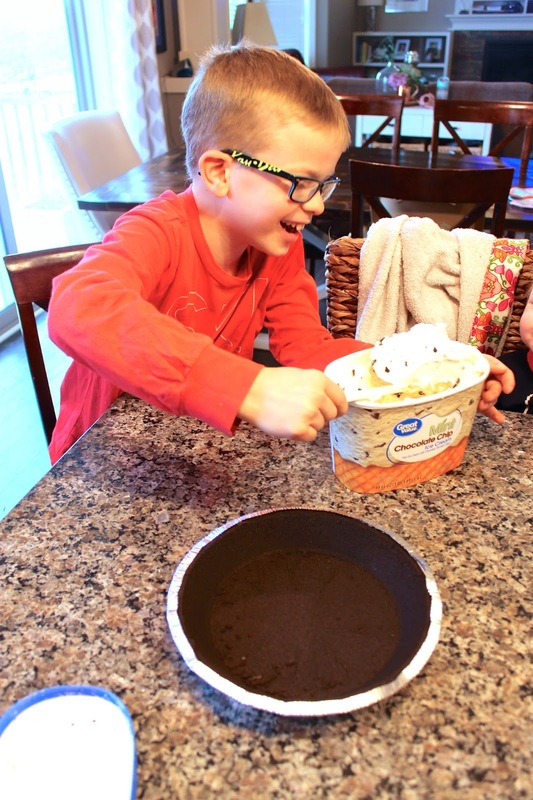 Ice cream pies are simple and always a fan favorite. Have you ever made one? What flavor would you make?